20 Caps / 600 mg. Freeze dried whole leaf organic aloe helps provide safe,gentle, natural relief from constipation. Gently helps lift and ﬂush toxic waste from the intestinal tract. Provides active enzymes to promote increased colon cleaning. INGREDIENTS: Aloe PURE™ is made from the whole leaf of hydroponically grown aloe plants, ensuring the purest grade of Aloe -Vera. The leaf contains active enzymes to help break down and dissolve foods. The yellow gel contained on the inside of the aloe leaf has been used for centuries as a natural, safe, non-addicting internal cleanse. 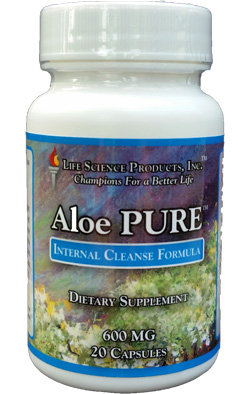 SUGGESTED USE: Initially, to help relieve the body of toxic waste buildup, one Aloe PURE™ capsule should be taken at night with a meal for 2 to 4 nights in a row. Then use Aloe PURE™ as needed but never take more than one capsule per day. Extensive research since the 1930’s has reported dramatic healing properties that may be beneficial to the human body. * Studies have shown that certain aloe plants contain trace amounts of over 80 vitamins and nutrients, 18 amino acids, 20 minerals, essential oils, enzymes, glycoproteins and some 200 active compounds. Aloe PURE™ helps to prepare the body in support of the friendly soil borne organisms (SBOs) that are in our Body Biotics™ Bio-Identical SBO Probiotics Consortia, by assisting the body in gently removing toxic waste and putrefaction, thereby, allowing for improved colonization of the friendly bacteria.